Amanda Murphy Design: The cover! Veranda made the cover of the March issue of Fons and Porter's Love of Quilting! Thanks for the votes, all of you! Very exciting! I love the colors. So proud to say I know the lady behind the fabric. Congratulations. Congratulations! I'll be sure and get that issue. Congratulations Amanda! What a great pose for Veranda, too! Have a super day! Congratulations! It looks lovely, and it's a well-deserved recognition! Yay you! I knew she was a cover girl! Congratulations!!! It was a great choice. I can see why... it's a beautiful quilt! Horray for you Amanda...the cover is beautiful. Congrats-I knew it had to make it; it was the most eye-catching of the quilts!! It's beautiful, totally worthy of a magazine cover. Congrats. Well done. I can't wait for my issue to arrive. Congratulations glad you made the cover, you deserved it and I will be sure to get this issue. Congratulations Amanda! That is awesome! 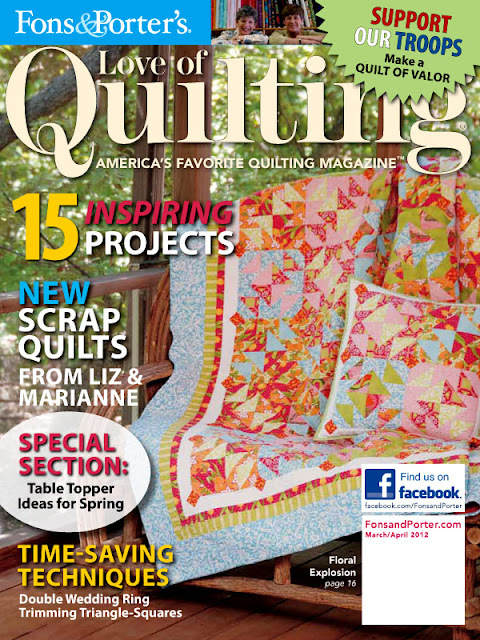 Congratulations for getting your pretty quilt on the cover!